These living reef structures provide shelter, food and breeding grounds for numerous marine plants and animals. Coral reefs are the basis for a dynamic ecosystem with tremendous biodiversity. For example, most of Florida's sport fish species and many other marine animals spend significant parts of their lives around coral reefs. Reef building corals are found in tropical and subtropical waters around the world. Corals can be found in oceans all over the world, on the deep sea floor, and even under the ice cap! Corals have specific requirements for habitat conditions. Ecological measurements of living organisms consist of two broad classes of data. The first is a measure of selected ecological components (mass, volume, biomass or square area). The second is a measure of the number of species that make up each of the selected ecological components. Most coral monitoring projects use percent cover as a measure of area and species richness or species diversity as the measure of the number of species. For more information read the pdf file titled "Coral Sea Stats." How Are Coral Communities Measured? Ecological measurements of living organisms consist of two broad classes of data. Th e first is a measure of selected ecological components (mass, volume, biomass or square area). The second is a measure of the number of species that make up each of the selected ecological components. Most coral monitoring projects use percent cover as a measure of area and species richness or species diversity as the measure of number of species. 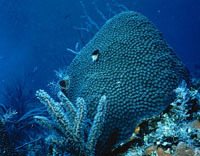 For more information read Florida's Coral Reefs. See the Coral Reef Monitoring Project for more information about coral monitoring programs at the Fish and Wildlife Conservation Commission. The Southeast Florida Coral Reef Initiative (SEFCRI) is a local action strategy for collaborative action among government and non-governmental partners to identify and implement priority actions needed to reduce key threats to coral reef resources in southeast Florida. The targeted area includes Miami-Dade, Broward, Palm Beach and Martin counties. Learn more at their website. Hardbottom habitats are generally dominated by octocorals with low hard coral cover and species diversity. 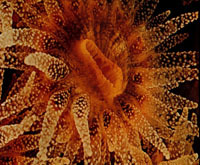 Shallow offshore habitats are high-energy environments with large branching corals and expanses of bladed fire coral and yellow sea-mat (a different type of Cnidarian called zooanthid). Deep offshore reef habitats are inhabited by a diverse array of benthic (bottom dwelling) organisms including large sponges, octocorals, and stony corals.